I emailed a company and presented them the idea of what I wanted to achieve. They were very prompt with their email reply as well as professional and knowledgable. I had several questions and each answer brought new questions. We ended up emailing back and forth several times, to the point where they called me to expedite my inquiry. They were very helpful and accommodating, which I find to be a rare commodity in B2B relationships these days. 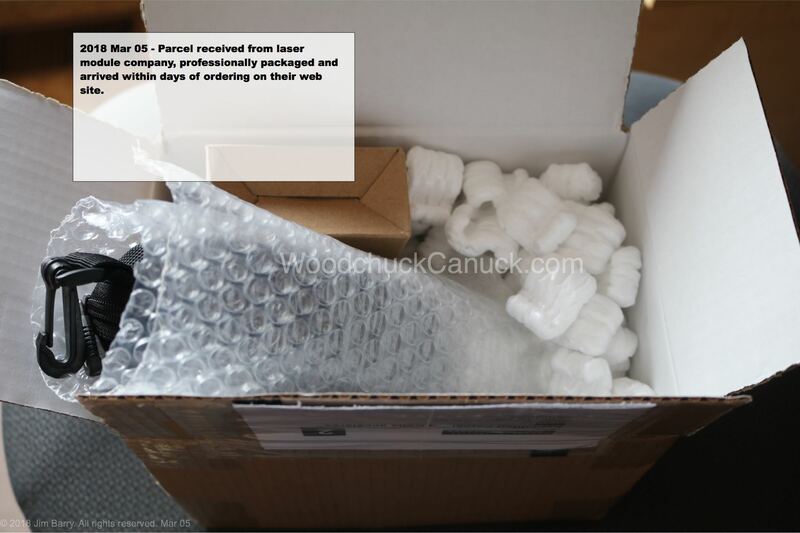 The box arrived, professionally packed and included everything we had discussed. Here is where I mounted the kit. 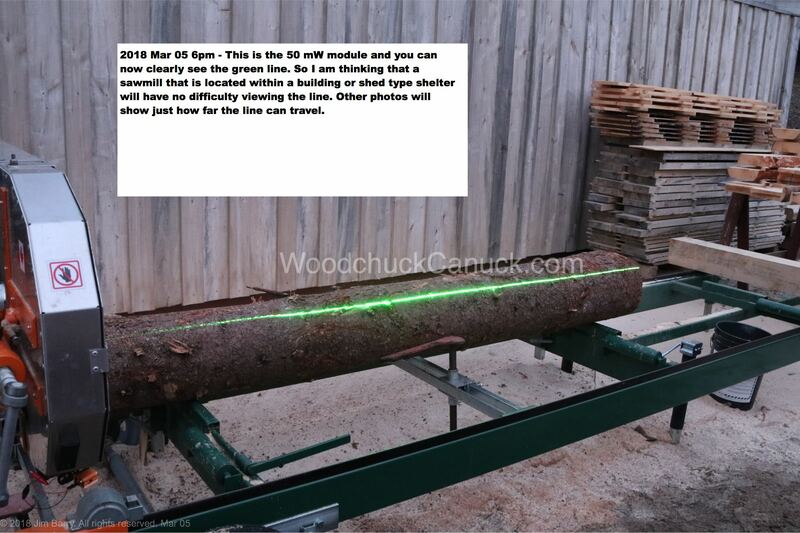 I discovered that the electrical leads of the battery box could make contact with the aluminum housing of the sawmill, which can cause the laser module to not work. So either the battery box, or the mounting bracket, should be insulated from the aluminum housing. 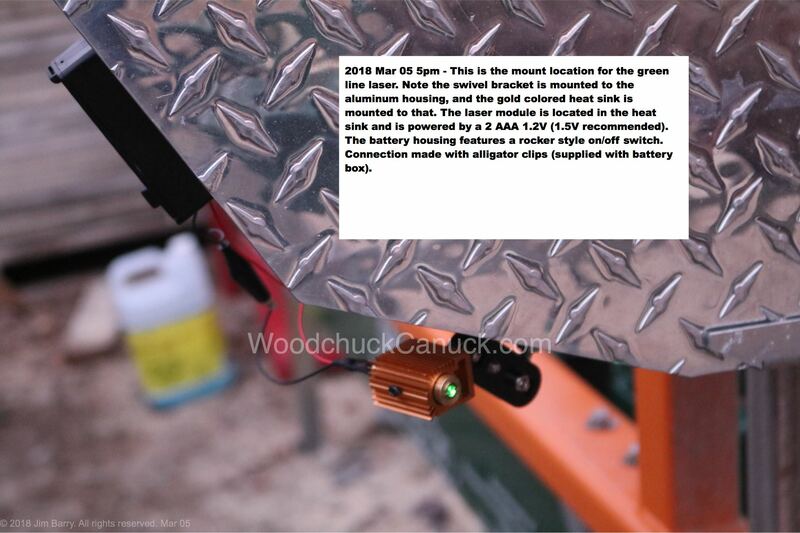 The battery box and the laser are not weather proof. I will be placing a roof over the sawmill at some point in the future, but for now I will have to construct some sort of weather shield. My mill is outdoors, so I was already under the assumption that I would not see laser line under full sun. That turned out to be accurate for the 10 mW and the 20 mW modules. The 50 mW module was visible when clouds are present. 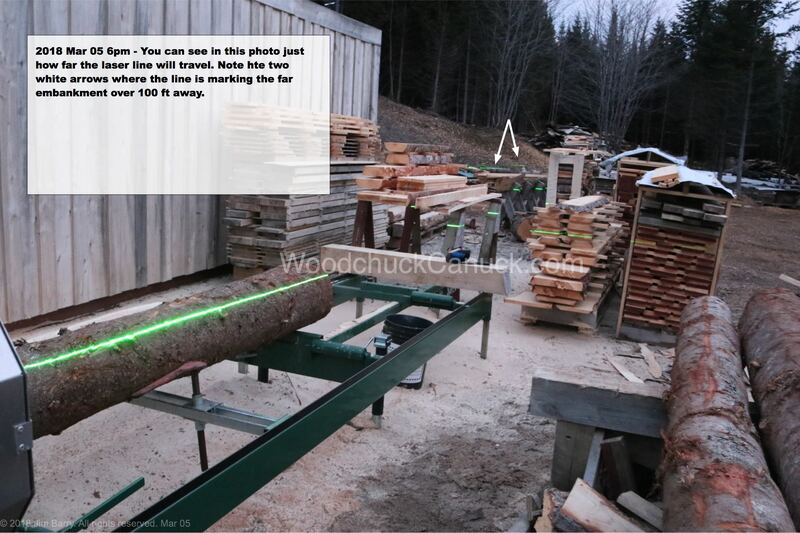 There is no doubt that if the sawmill was under a shelter, this laser line using any of those powers would be more visible. So I waited an hour. I figured that at 6 pm the lighting conditions would be similar to that of being under a roof shelter. The 50 mW laser did not disappoint, casting a easy to see beam of light. 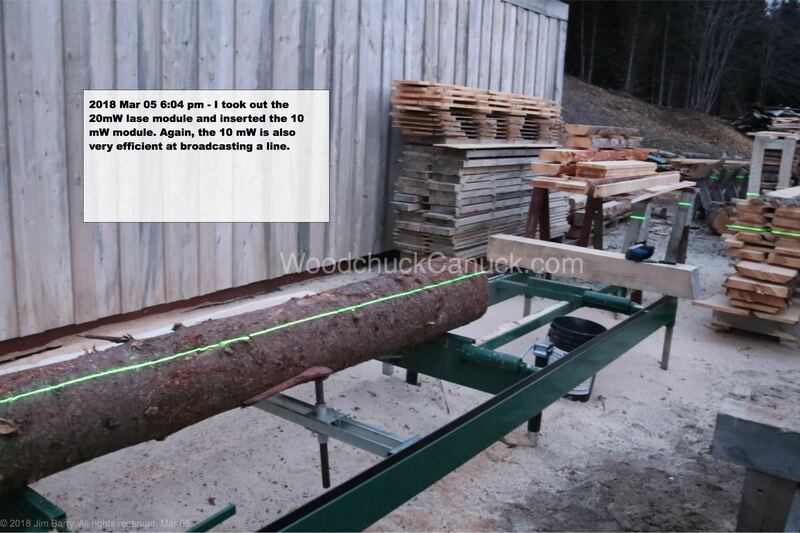 It not only cast a light on the log, but right across the work yard, easily reaching the embarkment more than 100 ft away. Its quickly starting to turn dusk so I took out the 50 mW module and placed the 20 mW module in its place. The results were impressively similar. To my surprise, even the 10 mW module broadcast a line that was easily viewable. All that is left to do now is field testing. 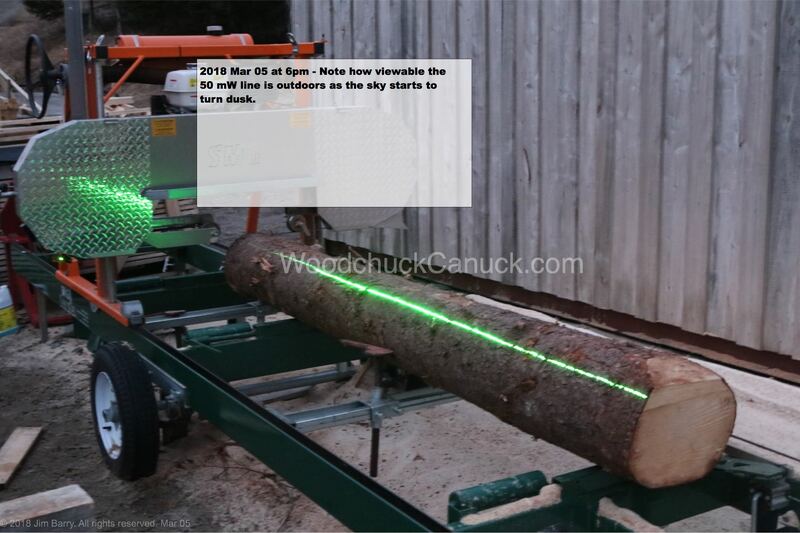 That is, to run the saw and cut some logs, to see how the laser module, mounting bracket and battery box endures the harsh environment (vibrations and dust) of the sawmill. Check back again for more results. I have used the laser a couple times this year. 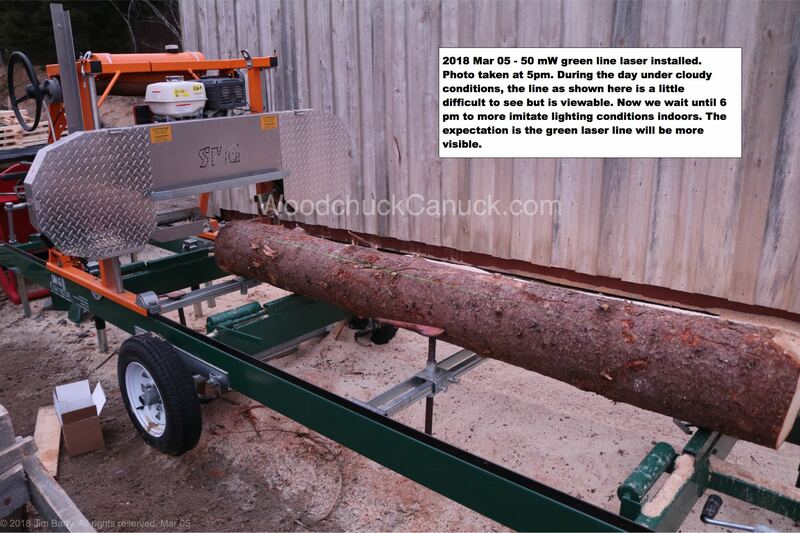 I have not sawed much this past summer so I haven’t used it much. For the few times i have used it, its worked well. The mount keeps its position pretty good. The head of my saw doesn’t vibrate much. 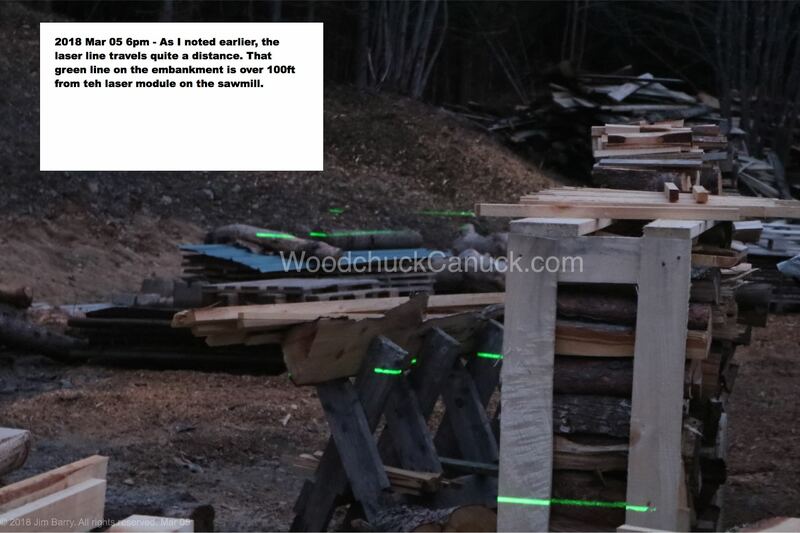 Usually about 10 logs or so I might have to readjust the laser line. 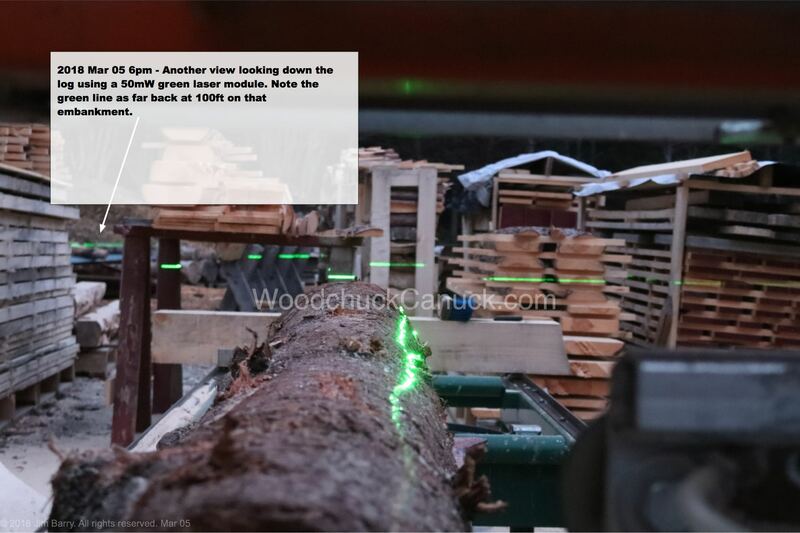 Keep in mind the purpose of the laser for me is to estimate blade position across the log when dealing with heavy tapered logs or odd shaped logs. Some people have inquired about where I got the kits. I bought them from Apinex, located in Quebec Canada. They sell direct. I have the 10mW and the 20mW lasers for sale, left over from testing. 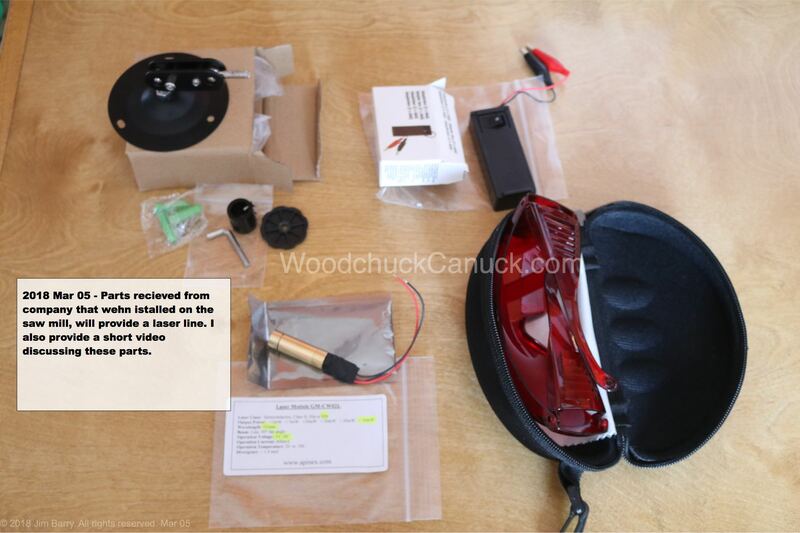 As well as one mount kit and battery kit. Contact me if you are interested in any of them. Does vibration have any effect on the steadiness of the line mounted in this location? Not that I have noticed. Usually once a day I check at the beginning of the day. Some days no adjustment is needed. Other days a minor adj is required. The location is more prone to me running into it with my coat or loops on the work pants. 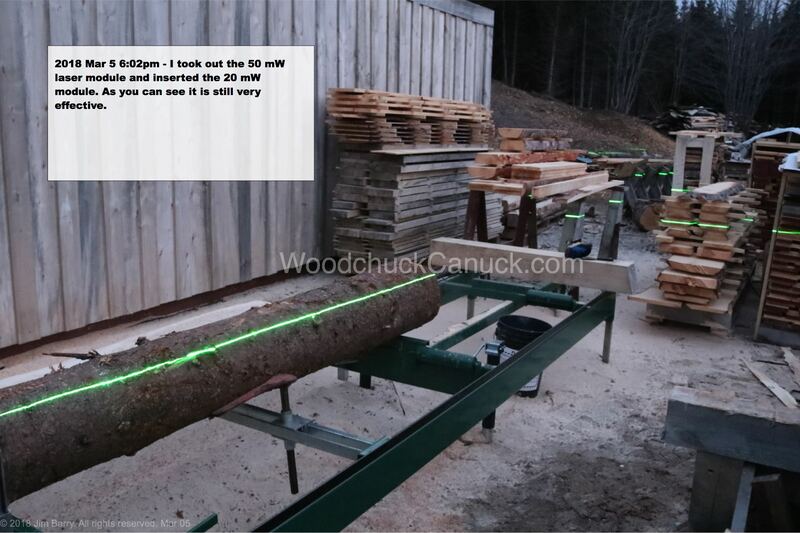 I read your post about Saw Mill Laser Installation, very nice project. 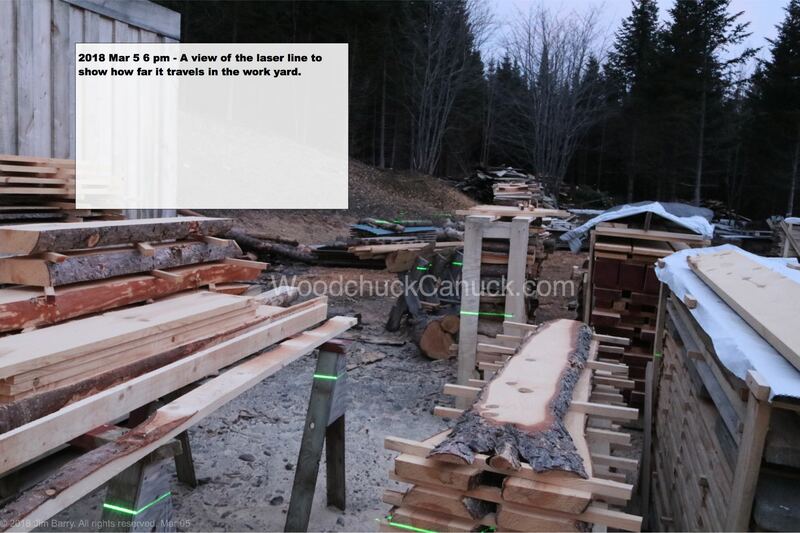 I have a Saw Mill too, and I am searching for a Laser. Please can you give me contact address about company from where you purchased. Hi, I can’t find the information right now, but I do have a 10mW laser kit here that I can sell you if you are interested.